When you run a batch check with Acrolinx, you can open the Content Analysis dashboard after the check. The dashboard opens in your browser. 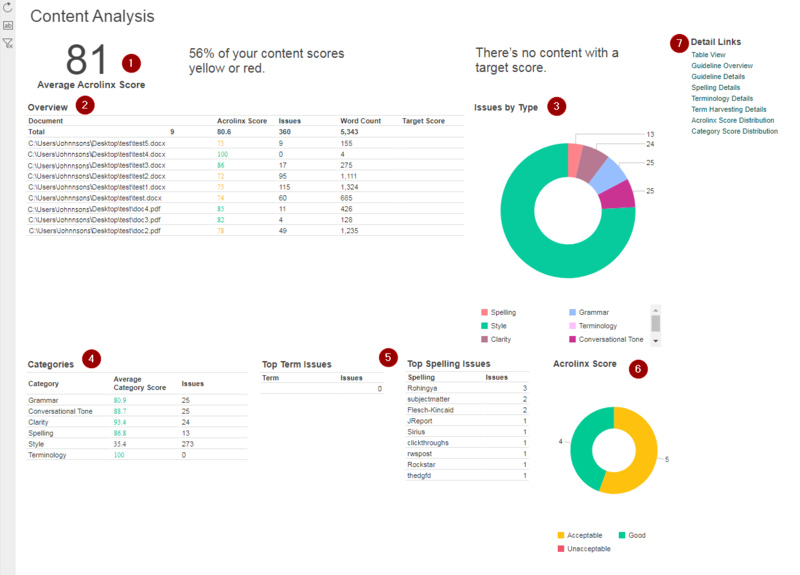 In the Content Analysis dashboard, you'll see the overall quality of the content that you've checked. It provides different charts and breakdowns of the statistics, to equip you with a powerful analysis tool. You can adjust the charts and filter the web reports that open when you click on the Detail Links. If you want to know how, see our Analytics Dashboards Tutorial . Note: Filter options aren’t available in the Content Analysis dashboard. In tables, you can sort by clicking on the header. Average Acrolinx Score Acrolinx Score, that is the average score of all included content. Overview See the Acrolinx Score for each document and compare it to the target score. The table also displays the total number of issues found and words checked in the document. Tip: Click on the file name to open the Scorecard in a new tab. Issues by Type View all issues broken down by type. Categories See the average category score and the number of issues Acrolinx found for each category. Top Term Issues and Top Spelling Issues What are the most common terms and spelling issues? You can find out with these two tables. Acrolinx Score See how much of the checked content got good (green), acceptable (yellow) or unacceptable (red) Scores. Table View Open a web report to see your results broken down in a table. Guideline Overview Open a table that shows you the frequency of every guideline. Guideline Details Have a closer look at how often Acrolinx found guideline issues. View these issues in their context. Spelling Details Have a closer look at how often Acrolinx found spelling issues. View these issues in their context. Terminology Details Have a closer look at how often Acrolinx found terminology issues. View these issues in their context. Term Harvesting Details Are there any term candidates for your terminology? View potential new terms that Acrolinx found during your batch check. The table shows the 2,500 most frequent groups of term variations. From here you can also export your candidates to add them to your terminology database. To do so follow the instructions in Adding Harvested Terms to Your Terminology Database. Note that this Detail Link is only available with Acrolinx 5.5. Acrolinx Score Distribution See the distribution of Acrolinx Scores in a bar chart. The Acrolinx Scores are defined in ranges on the x-axis. The numbers of checks (check count) are on the y-axis. Category Score Distribution See how the Scores are distributed per category in a chart. The category scores are defined in ranges on the x-axis. The numbers of checks per category (check count) are on the y-axis. Note that Internet Explorer 11 has some problems displaying the Content Analysis dashboard. You might want to set another browser as default. If you’re in an intranet network and see an empty Content Analysis dashboard in Internet Explorer 11, press “Alt+T” to open the tools menu. Select Compatibility View settings, and uncheck Display intranet sites in Compatibility View .